OXFORD — Keep up to date with the race right here, with periodic dispatches from the track all day. Also, all Tweets from the day's action bearing the tag #Oxford250 wil apear below, aggregating all of your top comments in one spot. 8:33 p.m. - Curtis Gerry of Waterboro wins the 44th Oxford 250. Reid Lanpher finished second. Gerry originally took the lead from Cassius Clark on lap 125, then had to make his way back to the front. Clark was third, followed by two-time champ Eddie MacDonald and three-time champ Mike Rowe. 8:27 p.m. - DJ Shaw and Mike Rowe connect in turns three and four on lap 237 to bring out the 17th caution. Curtis Gerry and Eddie MacDonald had checked out. 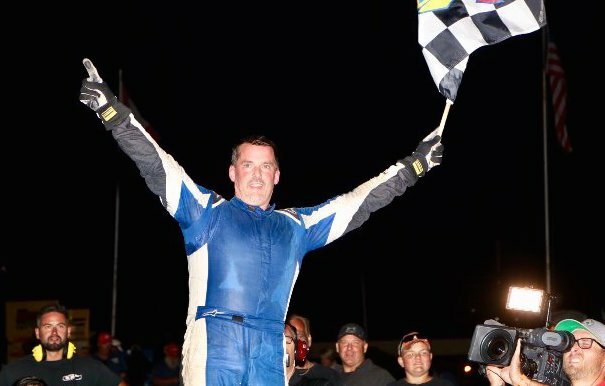 OXFORD — Defending Beech Ridge Motor Speedway Pro Series champion Curtis Gerry drove outside of Scott McDaniel on lap 198, survived four late restarts and hung on to win the 44th annual Scott's Recreation Oxford 250 Sunday night at Oxford Plains Speedway. Gerry, of Waterboro, led the race from laps 124 to 171 before pitting for service at lap 172. It didn't take long to mount another charge and get back into contention. Manchester native Reid Lanpher, the 2015 track champion at Beech Ridge, finished second, while early leader Cassius Clark settled for third. Two-time 250 winner Eddie MacDonald and three-time winner Mike Rowe completed the top five. OXFORD — When he started his racing career, Tracy Gordon says plan was to become the youngest driver to ever win the Oxford 250. The question back then was if, not when. For every Travis Benjamin, Eddie MacDonald, Ralph Nason or just about anyone with the last name of Rowe — all multi-time winners of the 250 — there are several more-than-deserving drivers who haven’t won once: Gordon, of course, and others such as Jeff Taylor, Johnny Clark and Dale Shaw. 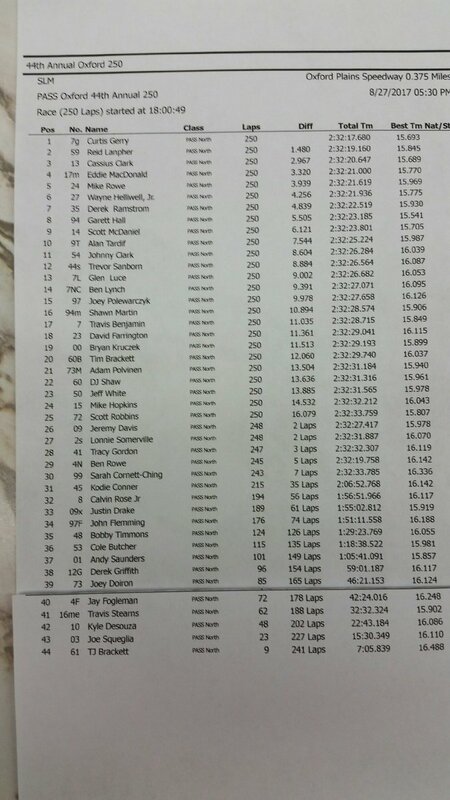 ...The race featured 17 caution periods, 11 of those before the halfway mark. It muted strategy throughout the middle stages of the race as drivers were unwilling to give up track position. Clark, who led a race-high 122 laps, yielded to Gerry at the exact midpoint as the race went into its longest green-flag run until Lap 172. OXFORD (WGME) -- Fans lined up at the Oxford Plains Motor Speedway to see the 44th annual Oxford 250 Sunday night. People arrived early to claim their spots in the stands getting ready for the big race. Caution-filled race negated various pit strategy plays. ...A rash of caution flags in the first half of the race — 11 of the race’s 17 caution periods came in the first 123 laps — kept all of the early contenders on a nearly identical strategy. With no long stretches of uninterrupted racing early on, teams were simply unwilling to give up track position that fresh tires could have overcome over the course of a 100-lap green-flag run in the middle stages of the race. Teams were allowed 10 tires for the Oxford 250 main event itself, the four tires they started the race on plus six tires they could change at any point.